SCVHistory.com LW2620b | William S. Hart | Hart as Messala in 'Ben-Hur' on Broadway, 1899-1901. William S. Hart as Messala in "Ben-Hur"
"Messala and Ben-Hur — Act I. Scene I." Plate following page 78 in The Player's Edition of "Ben Hur: A Tale of the Christ" (©1901 Harper & Brothers; ©1908 Henry L. Wallace). "Illustrated with scenes and characters from the play." The character of Messala is shown as William S. Hart. William S. Hart liked to say he "created" the role of Messala — and in a sense he did. He set the precedent for all "Messalas" to follow. Hart was the first to portray the bad-guy character when William Young's adaptation of General Lew Wallace's best-selling "Ben-Hur: A Tale of the Christ" opened at the Broadway Theater in New York City on November 29, 1899. Wallace wasn't too sure his 1880 book would translate to the stage, but, according to the General Lew Wallace Study & Museum in Crawfordsville, Ind. (northwest of Indianapolis), presenters Marc Klaw and Abraham Erlanger convinced him otherwise. 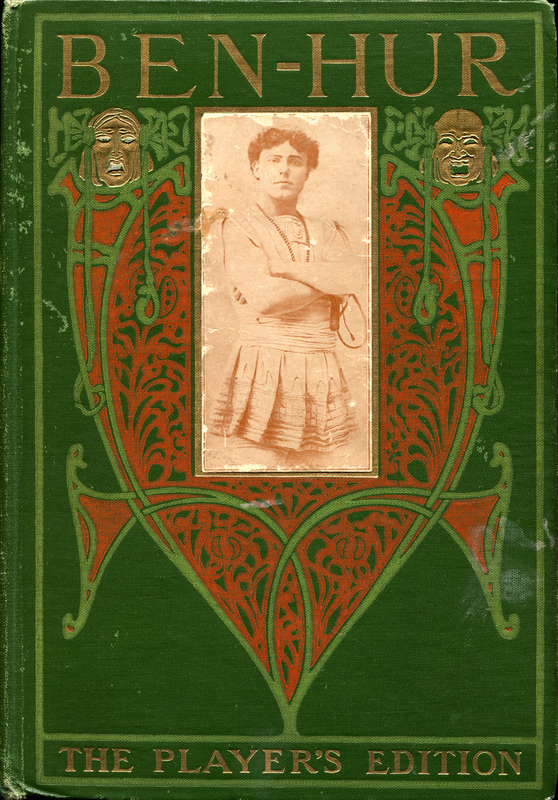 "The Player's Edition" of "Ben-Hur" (©1908). 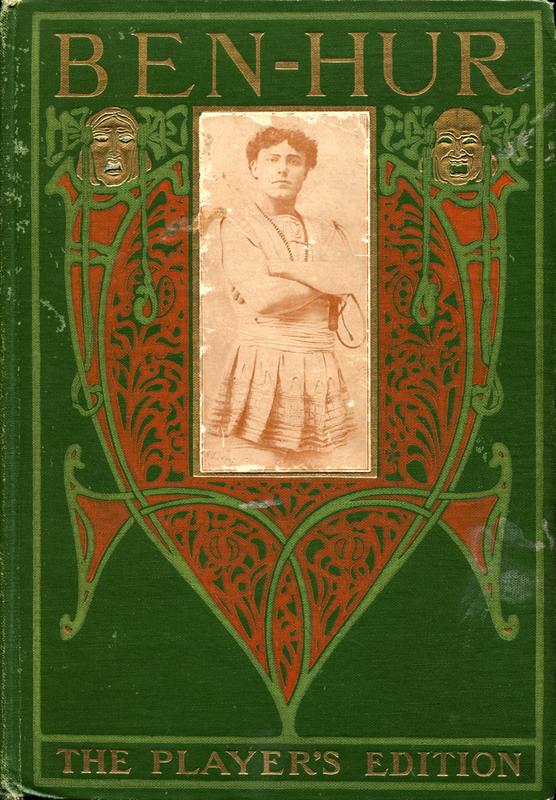 Photograph of actor Edward Morgan as Judah Ben-Hur incorporated into the cover. For one thing: How to portray Jesus? Simple. As a beam of white light. And the chariot race? That would take some engineering. Davis (2003:38) writes: "The climactic chariot race was created with two horses, a white and a black, side by side on double treadmills, supplemented with a mass of wheels, steel cables, levers, the sound of cracking whips, and a panorama of the Circus Maximus racing past as the two finalists struggled for victory. Ben Hur's and Messala's horses alternated in front of one another until they reached stage center, whereupon Ben Hur's chariot slowly pulled ahead and Messala's collapsed." Fans and critics were awed by the spectacle. 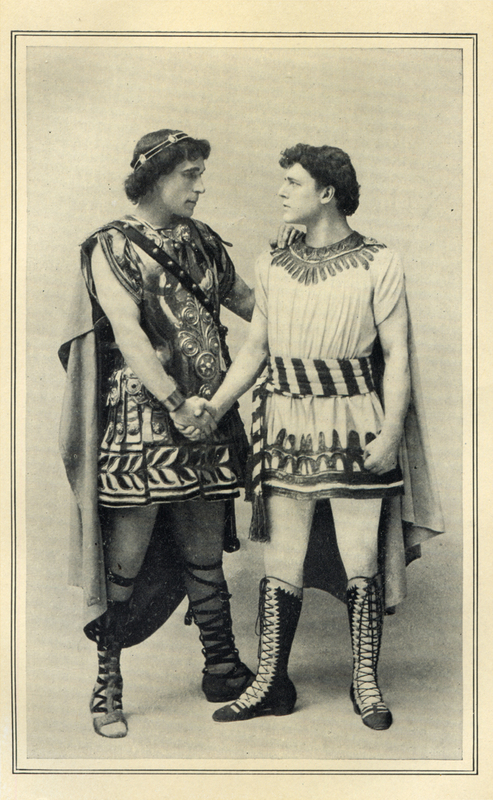 Edward Morgan opened as the first Judah Ben-Hur. While Hart was retained, most of the cast was replaced the following season. Morgan's title role went to an actor who would migrate to the silver screen around the same time as Hart: William Farnum, who stayed with "Ben-Hur" for five years. Dustin Farnum was his more famous brother. "Ben-Hur" ran for 21 years, touring from city to city throughout the U.S. on (usually) two-week engagements, also traveling to Europe and Australia. According to the Wallace Museum, it's estimated that more than 20 million people took in some 6,000 performances. Of course, Hart didn't stay with it all that time; just two seasons, in fact. The 1901-1902 season found him touring as the minister John Storm in the road-show production of novelist Hall Caine's "The Christian." "Ben-Hur" was dramatized as a motion picture in 1907, 1925, 1959 and 2003. For the famous 1959 picture starring Charlton Heston, the chariot race was coordinated by Yakima Canutt, who actually did more film work in the Santa Clarita Valley than Hart. LW2620b: 19200 dpi jpeg from book purchased 2014 by Leon Worden.